LOOKING FOR NEW HOME WITH ACREAGE CLOSE TO TOWN.... ? THIS ONE QUALIFIES FOR USDA, VA, FHA AND CONVENTIONAL FINANCING !! 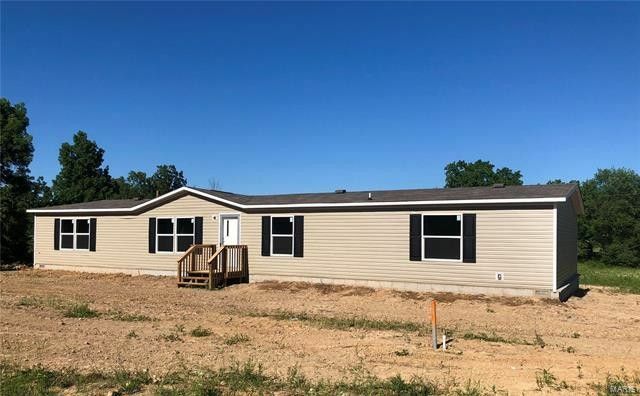 THIS BRAND NEW TRU HOME A CLAYTON MANUFACTURED HOME HAS 2016 SQ FT OF LIVING SPACE, ITS SETTING ON 3.09 ACRES AND OFFERS 4 BEDROOMS, 2 BATHS, 2 LIVING AREAS, SPLIT BEDROOM PLAN, CATHEDRAL CEILINGS, THE MASTER HAS A LARGE WALK IN CLOSET, THE KITCHEN IS OPEN TO BOTH LIVING AREAS. IT HAS A LARGE CENTER ISLAND. PLUS A BREAKFAST ROOM, A NICE LAUNDRY / PANTRY AREA OFF THE KITCHEN AND REAR DECK. YOU'LL HAVE A LOT OF PRIVACY AROUND YOU BUT STILL CONVENIENT TO TOWN. ENGINEERED FOUNDATION AND SEPTIC SYSTEM. LAND HAS BEEN SURVEYED. NEW CHAT DRIVEWAY WITH EXTRA PARKING AREA.